Tatyana McFadden took the lead early in the women’s wheelchair race and never let up. After taking top place in the race every year since 2010, she quickly proved why she’s a powerhouse in the sport.Within two miles of the start, she started passing several of the male racers. 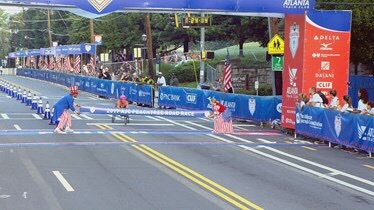 McFadden crossed the finish line of the AJC Peachtree Road Race with an unofficial time of 24:17. “This course is fierce,” McFadden told 11Alive at the finish line. “I love this race. It’s really technical and fast.” She vowed to return for race number eight next year. The 27-year-old continues her impressive streak including the Boston Marathon, the New York Marathon, and the London Marathon.